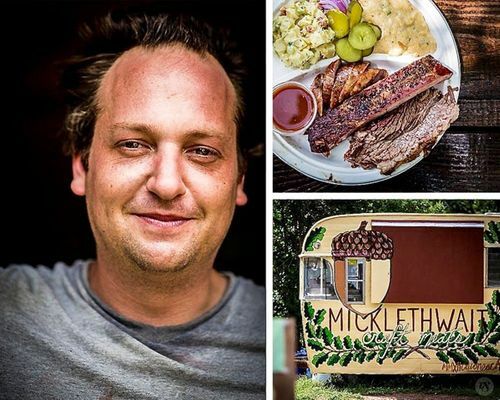 Tom Micklethwait is the owner and official pitmaster of Micklethwait Craft Meats. Tom turned to barbecue after a career in baking, and he found that the two had a common thread – manipulating primitive elements for different end results. He began experimenting with his own recipes and, at the same time, building out a vintage Comet trailer, both from scratch. Tom served his first barbecue plate out of the window of that trailer in December 2012. Fast-forward to 2017, and Micklethwait Craft Meats is proud to have ranked in Texas Monthly's Top 50 Barbecue Joints in Texas and in Austin Monthly's Best of ATX. Micklethwait Craft Meats is fiercely independent and dedicated to integrity, good humor, and top quality.